Robert E. Howard and I share a birthday. We also share a passion for fantasy stories. Although this is three days late, I thought it a perfect opportunity to pay tribute to one of my three icons. To call Robert E. Howard an icon is an understatement. Like Frank Frazetta and J.R.R. Tolkien, he is the reason I write fantasy fiction today. Also, like Frazetta and Tolkien, I discovered Howard courtesy of a tenth grade English assignment. To read about that, check out my post on Frazetta. For those of you who don’t know, Robert Howard created Conan the Barbarian and Solomon Kane, and is credited with creating Red Sonja (although the Sonja we know is a composite of his characters Red Sonya and Black Agnes by Roy Thomas and Barry Windsor-Smith). He is considered the father of barbarian and sword-and-sorcery fantasy. In a career spanning a brief decade, he published 800 stories, mostly in the pulp magazines of his time. Howard wrote in every genre of his day: fantasy, science-fiction, romance, adventure, horror, western (his personal favorite), and even contributed a few entries to his friend H.P. Lovecraft’s Cthulhu mythos. As a writer of sword-and-sorcery stories, I see Howard not just as the founder of my sub-genre, but as someone whose character types are desperately needed in our jaded times. His protagonists were good guys and gals. They stood for something. They fought against overwhelming obstacles, sometimes within themselves, and often lost. But they kept trying. I emulate that basic archetype within my own stories. If I wanted to write about protagonists who were indiscernible from the antagonists, and acted with less moral certitude — in other words, the style that has overtaken the fantasy genre today — I would simply transcribe the evening news. That is not to say that Howard’s characters are nice. I would not want Solomon Kane for a next door neighbor! Despite Hollywood’s portrayal, Conan was not just a slab of beef. He solved his problems more with his brains than his brawn. He feared only one thing — poets. He was a barbarian simply because he was an outsider to the various civilizations he visited. Yeah, I can relate to that. My interest in Howard is much deeper than his stature as a writer and an icon in my craft. We share a number of eerie similarities. We were both born on January 22. An Aquarian born on the cusp with Capricorn explains much. He died in 1936, and I was born in 1963. We are both only children. We both suffer from chronic depression. We are both notorious coffee addicts. We both grew up and lived in small towns we despised, although I got out. We both have overly protective mothers with too much of a Fundamentalist Christian bent. We both revere the old Saxons, Celts, and Germans, and think “barbarians” are much better people than the so-called “civilized” folk. There is a divot in my skull at about the spot where Howard placed the barrel of a pistol. I now live 100 miles from his home in Texas. It’s almost enough to make me believe in reincarnation, except for the differences. Howard shot himself at age 30. At age 52, I’m still going strong, despite days when the chronic depression becomes physically painful. He died an unmarried virgin. I just celebrated my 28th wedding anniversary, and no, we do not have a celibate marriage. He published 800 stories by his 30th year. I have … uh … one to my credit. Finally, why on this green Earth would I want to try it again! Besides, there have not been enough celebrities or people of fame throughout history to provide reincarnated souls for the sheer number of folk claiming to be them right now. Out there somewhere are probably at least twelve people claiming to have been Robert E. Howard. I will leave his reincarnation to the realm of Weird Tales, and to overdoses of mescaline. The following photograph is still one of my favorites. It was taken on June 12, 2011. 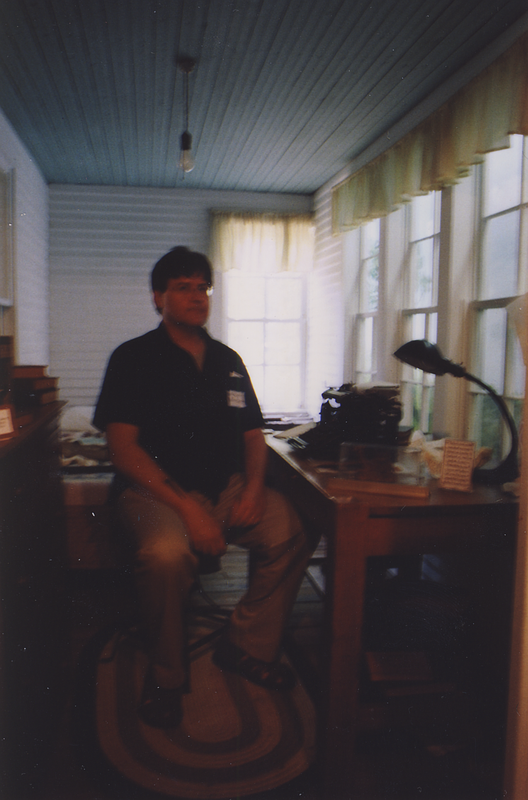 That is me, sitting in Robert E. Howard’s room in his house, now a museum in Cross Plains, Texas. The docent was kind enough to let me inside the roped off room, which was a rare opportunity. Sorry for the bluriness of the photograph. It was hard to focus my Nikon in that light. That is Howard’s desk, although not his typewriter. I swear, I could hear the tromp of Conan’s boots, see the sun glint off Red Sonja’s chain mail, and feel the righteous indignation of Solomon Kane in that room. Howard’s room had once been the sleeping porch, walled in by his father to give him his own bedroom. Howard wrote 800 short stories and one novel in this room. This proves that one can write anywhere, even in a space no larger than most apartment kitchens. When we visited Howard’s grave in 2011, someone left a paperback book as tribute. It was a copy of Conan the Adventurer, the very book that started me on the path I now find myself. If we are still in Texas this coming June, we shall have to pay another visit to Robert E. Howard Days (Cross Plains’ annual celebration of his life), and visit his grave again. This time, I will leave my own tribute. Perhaps a coin. Perhaps a stone. Perhaps a small picture of Aura Lockhaven. Just a way of saying thank you to one of the three men who started it all for me. This entry was tagged fantasy, robert e. howard. Bookmark the permalink.